Yorkshire Day suddenly fell flat for England at Edgbaston as Jonny Bairstow and Joe Root’s high hopes were dashed against India. England were on course for a substantial first-innings total while Root (80) and his fellow Yorkshireman Bairstow (70) were sharing a fourth-wicket stand of 104 in only 23 overs. But just as the hosts threatened to dominate their 1,000th Test, Root was cut off in his prime – run out, once more short of a 14th Test century which has eluded him for the past year. Ravi Ashwin finished with 4-60 as England folded to an underwhelming 285-9 at stumps. England would have been all out, in fact, had a tough caught-behind chance been held when Sam Curran edged Mohammed Shami’s penultimate ball of day one. For his trouble, the first of three wickets to fall for eight runs from 216-3, Root’s misfortune was accompanied by a full-house ‘send-off’ from his opposite number Virat Kohli. Having batted with him today, he’s taught me a hell of a lot – which is awesome, just to watch a master at his work. He’s a fantastic player, fantastic guy. It was the India captain who produced the brilliant piece of fielding, with a direct-hit throw on the turn after Bairstow called an ambitious two barely to the edge of the square at midwicket. Behind Root as he stormed off, Kohli then celebrated by blowing a kiss, mouthing some fruity advice, putting his finger to his lips and adding a ‘mic-drop’ mime – mocking Root’s gesture last month, after clinching the one-day international series at Headingley with a second successive hundred. “Everybody is entitled to celebrate how they want to,” said Root’s team-mate Keaton Jennings. It remains to be seen whether match referee Jeff Crowe takes the same view, or decides instead some censure is in order for Kohli. As for relations between Root and Bairstow, Jennings confirmed no hard feelings – despite the former’s obvious annoyance at losing his wicket through little fault of his own. “It’s fine,” said the opener. “That’s cricket... it’s based on human error. Whether it was a mix-up, I don’t know, I wasn’t in the middle. It seemed Bairstow owed his captain some extra runs, and he might have been well-advised to stay put for other reasons too – but he got little further before he edged on trying to cut Umesh Yadav. Then new England vice-captain Jos Buttler was lbw for a second-ball duck, pushing forward to Ashwin – and after Ben Stokes poked a catch back at the off-spinner, it was left to Curran and Adil Rashid to limit the damage. It was a miserable passage of play for England in the hour after tea, on a day when they had long seemed sure to vindicate Root’s decision to bat first on a pitch of even pace and true bounce. Root did at least bag one notable career milestone, displacing Alastair Cook as his country’s quickest to 6,000 Test runs when he reached 40 here. England had prefaced their evening woe with an earlier stumble which left them 112-3 – before Root and Bairstow joined forces in early afternoon. Only Cook fell in the first session, his front-foot defence defeated by a perfect off-break from Ashwin – repaying his introduction in only the seventh over, despite being India’s sole spinner here, with telling drift from round the wicket before the ball turned and dislodged the off-bail. Jennings survived on nine when Ajinkya Rahane dived in front of Kohli off Ishant Sharma, from fourth across third slip, but could not hold the edge. The return of Shami for his second spell did for Jennings and ended the second-wicket stand on 72, in curious circumstances. The opener managed only to push the ball down into his crease off back-foot defence, then onto his foot before it trickled back onto the base of the stumps. Dawid Malan had an lbw scare against Ashwin, up the pitch and just outside the line on impact, only to go the same way to Shami when the seamer pinned him from round the wicket. It was therefore over to Yorkshire, in an hour of need on the White Rose’s annual day in the sun. 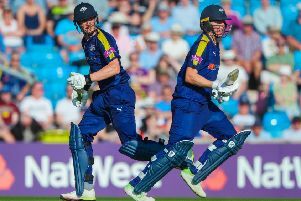 Root and Bairstow duly delivered – for a while at least.